Yu-Gi-Oh! TCG Event Coverage » ATTACK OF THE GIANT CARDS!! Winner #2! Home > 2018/03 - Salt Lake City, UT, Yu-Gi-Oh! Championship Series	> ATTACK OF THE GIANT CARDS!! Winner #2! Take a look at the winner of Sunday’s ATTACK OF THE GIANT CARDS!! Tournament here at YCS Salt Lake City! 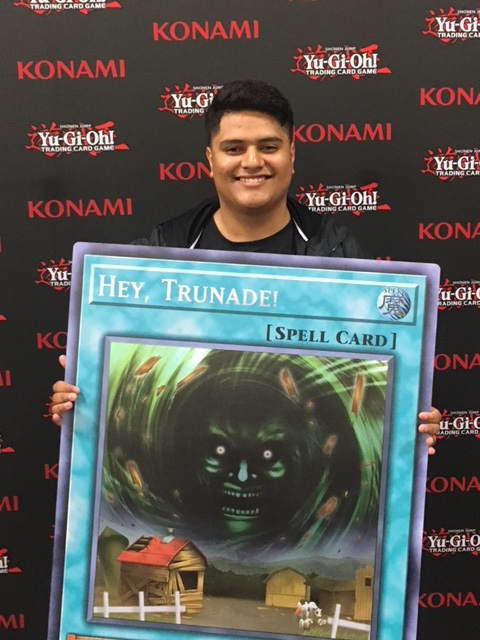 Francisco Alcatraz from Los Angeles, California used his Mekk-Knight Invoked Deck to best the competition and win a GIANT Hey, Trunade! to take home. Congratulations! Sunday’s Dragon Duel Top 4 at YCS Salt Lake City! Top 4 Pairings and Decks!